Beaumaris driveway gates with serpentine style rising head. Shown in Meranti. 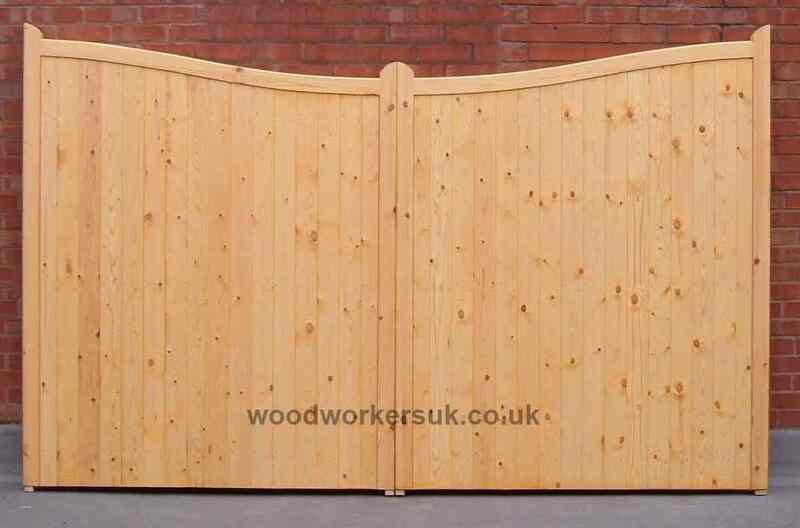 Our Beaumaris timber driveway gates will greatly enhance the kerb appeal of any property with their elegant ‘Serpentine’ style rising head. The serpentine shaped head features a rise of 6″ (150mm) from the lower point (other rises can also be manufactured, please contact us). Rear view of our Beaumaris gates, showing the rails and bracing. If you prefer then the Beaumaris can also be manufactured with the curve dropping to the centre. 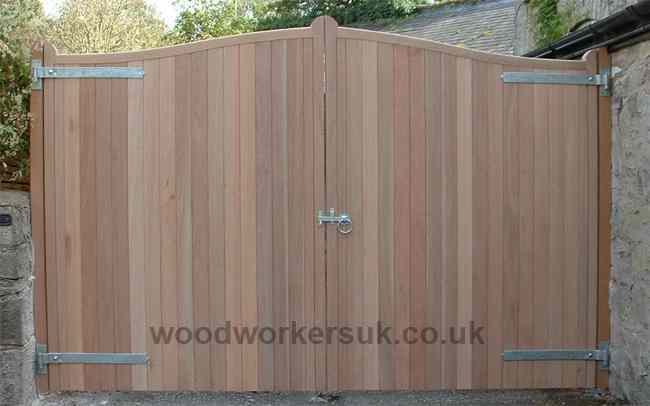 An open boarded version of our Beaumaris driveway gates is also available and the gates can also be supplied made suitable for automation (please contact us for details). 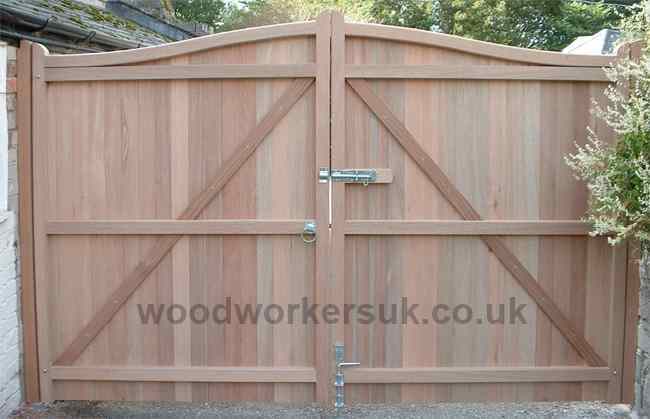 The Beaumaris driveway gates are also available as a ‘Low centre’ (dropping to the centre) pair, shown above in Scandinavian Redwood (Softwood). Low centre or high centre versions of the Beaumaris? The high centre versions of the Beaumaris tends to be most popular but if you do need the low centre then please let us know! Both versions are made exactly the same and in fact it’s just the configuration of the diagonal braces on the rear of the gates that differ – just let us know which version you require as you place an order! Arched headed – Match the overall height of our arched headed gate with the highest point of the Beaumaris. Curved headed – As with the Arched headed gate, match the height of the Curved headed gate with the highest point of your Beaumaris. Denbigh – Match the height of the Denbigh pedestrian gates to either the lowest or highest point of the Beaumaris pair. All top edges on any horizontal rails of the Beaumaris feature an angled water run off, this stops the build up of moisture on your gates and makes for a longer lifespan. The stiles of the Beaumaris gates (vertical outer uprights of the gate frame) also have rounded outer edges. Caernarfon driveway gates – These feature a similar serpentine rising head, but with a vision panel added just below! Colwyn driveway gates – A bit more minimalist than the Beaumaris, the Colwyn have a 150mm / 6″ rising head but it’s a straight rise with no Serpentine shape! The Beaumaris guide prices are based on a pair of gates 5ft 6 rising to 6ft high x 6ft overall wide (approx 1680mm rising to 1830mm high x 1830mm overall wide) equally split gates, these are NOT from prices, smaller gates will be more economical etc – contact us for a price! All prices are correct time of insertion and are EX VAT. Free delivery to most parts of the UK mainland is included – exclusions do apply, again please contact us. We use Unsorted Scandinavian Redwood, despite its name it is sorted for smaller knot size and less of them for better strength. Creamy white to yellow in colour. Used as a Mahogany substitute. Can vary in colour from a pinky red to dark red colour.Can be painted or stained. A plain light brown timber which gives the Oak look but without the Oak price tag. As strong as English Oak. Also known in the trade as ‘poor mans oak’.Can be stained, however avoid painting. To get a personalised costing on our Beaumaris driveway gates please use the form below.